I don't have any real statistics to back this up, but I have to imagine that the worlds biggest water fight takes place in Bangkok, Thailand during Songkran or New Year. It is a fantastically fun, if not crazy event. No one is off limits--people line the streets with hoses, water guns and buckets of water. People riding in the back of mini-trucks carrying barrels of water, make a clean get away after they splash/soak unsuspecting pedestrians (such as ourselves). I actually got off easy as I was carrying the camera and begged for mercy--the girls didn't fare as well, but given that is was like 35*C with insane humidity, the cold water was a welcome relief. 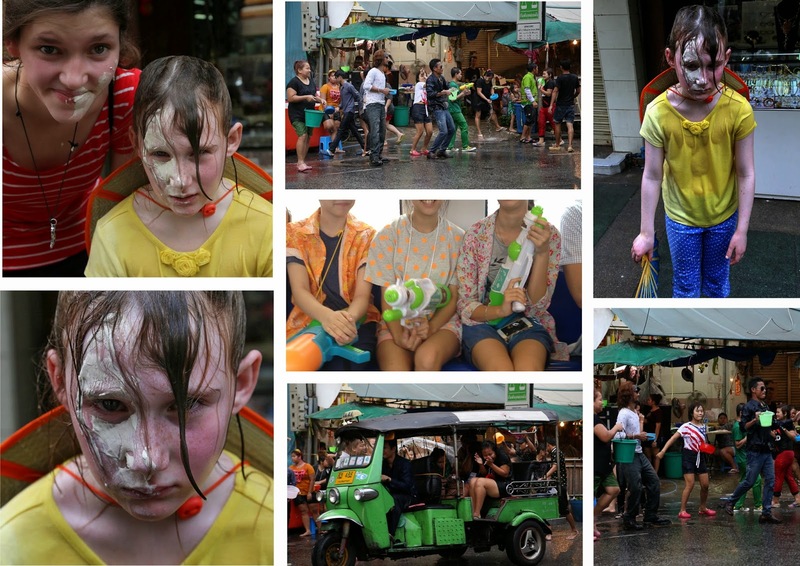 I was told a few different things about why they have a water fight--Songkran marks the New Year as winter passes into Spring. It is the beginning or end of the rainy season and water represents washing away the old making new. It is a time for Thai to visit temple shrines and participate in special observances. The air is filled with incense and corner shrines are adorned with beautiful floral arrangements. It is a wildly fun time to visit Bangkok! She does not look thrilled or is she pretending to not be thrilled. Have fun in Egypt!